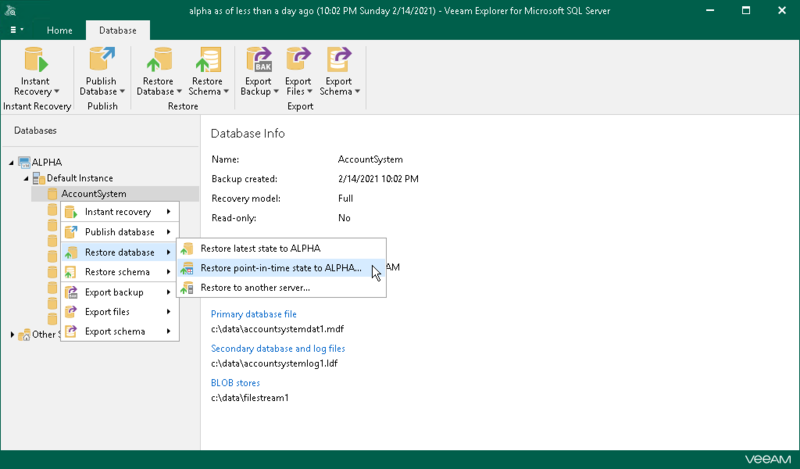 In the navigation pane, select a database, instance or a SQL server. You can select the root instance node to restore all the available databases at once. On the Database tab, select Restore Database > Restore point-in-time state to <server_name>\<instance_name> or right-click a database and select Restore Database > Restore point-in-time state to <server_name>\<instance_name>. Some databases might be restored as of the different time interval. Some databases cannot be restored if there are no transaction logs available for the specified period.